The studies are completed, and the research is done — meals around the family dinner table help you bond with your children and provide numerous benefits. Family mealtimes forge valuable connections that provide the stability that kids and parents alike so desperately need. A warm atmosphere and a great piece of furniture go a long way in fostering these crucial benefits. You can share struggles and triumphs along with jokes and laughter, creating memories that will last for generations. 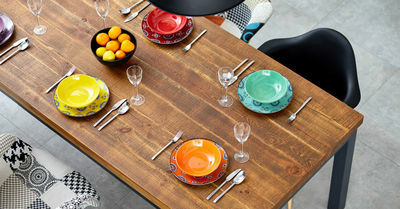 As such, the right dining room table might just be the most important piece of furniture that you choose for your home. Follow these basic tips to find the right table for your family. Size – Consider the number of people who usually eat dinner together and be sure to plan for guests. Once you have decided on the maximum number of people, look at the available space that you have. Shape – Next, you will need to choose a shape. Rectangle or square shapes allow you to seat more people, so opt for these if you usually feed a crowd. If you don’t have as many people, pick a round table, which gives you a more intimate eating experience and takes up less space overall. Seating – You will also want to look at various seating options. A bench works well for tight spaces, and young ones can climb up and down easily. Chairs with arms provide support for the elderly so they can sit and stand. Appeal – You want a design that is practical and that you love. Consider the difference between a formal dining room table and one for everyday use. Daily wear requires something that holds up well and that can take the traffic and hectic pace of your family’s life. However, you don’t want to sacrifice quality for something trendy. Increased vocabulary skills for young children – Family dinners boost the amount of new words that kids learn at an incredible rate — 1,000 words at dinner vs. 143 words from parents reading to them. Improved test achievement scores – Family dinners predict high achievement scores in greater measures than any of the following: music or art activities, sports, homework completion and school attendance. Better academic performance – Teens who eat dinner with their families twice a week were half as likely to receive grades of 90 percent or higher as those who ate meals with the family at least five nights a week. Healthier eating habits – Family dinners promote eating fruits and veggies, trying new foods and better portion control. All of these are a great combination for a healthy lifestyle. Fewer high-risk teen behaviors – Family dinners encourage stronger overall mental health, including a lower risk of depression, reduced risk of suicide and a lower rate of eating disorders. The right table design will not only provide visual appeal and improve the overall feel of your home but will strengthen your family life and the character and mental health of your children.